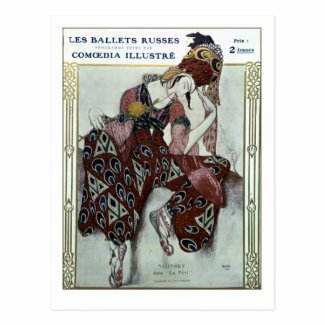 Now here’s a vintage ballet theatre programme illustrated by Léon Bakst that I haven’t played with! I bought it from Mindy Sommers at Vintage Stock Art and gave it a soupçon of restorative magic so that you can buy it as a greeting card, postcard, print or US stamp in the Theatre & Film section of First Night Vintage. You will also find many other products with the image at Fine Art America & England (see links below). The incomparable Vaslev Nijinsky (1890-1950) was so famous a dancer with Sergei Diaghilev’s (1872–1929) Les Ballets Russes that he, along with Diaghilev, was one of the few people known the world over by surname alone; both are inextricably linked with early 20th century arts. Nijinsky went on to choreograph Debussy’s L’Après-midi d’un faune (1912) and Stravinsky’s (1882–1971) The Rite of Spring (1913), which impresario Diaghilev produced. Ballets Russes was founded by the latter in 1909 and Stravinsky was not the only composer to be commissioned. Also included were Satie (1866–1925) and Rimsky-Korsakov (1844–1908), while there were sets designed by Picasso (1881–1973) and Jean Cocteau (1889–1963). Names to conjure with indeed. Add fellow dancers, Michael Fokine (1880–1942), Anna Pavlova (1881–1931) and George Balanchine (1904–83), and you can see why the company was so instrumental in reviving ballet as an art form. If you like this, as they say at many online stores and give you examples you wouldn’t touch with a bargepole, you might also like Schéhérazade. It is so tough these days to find original cards and accessories for birthdays and anniversaries. If you are looking for that gift or card for someone special then do check out Sarah Vernon on First Night Design. A lovely image in the Art Nouveau style. It reminded me of the work of Aubrey Beardsley. I am sure that there is a market for this quality of work, and I hope that you find it, Sarah. You’re right – something about the shape of the pose is reminiscent of Beardsley. 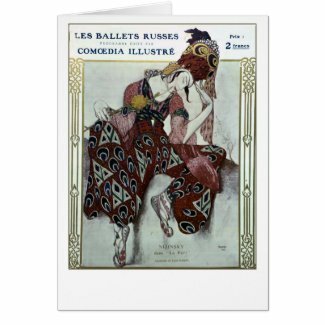 I’ve already sold a few postcards of the Schéhérazade Bakst so yes, there is a market. Thanks, Pete. Thank you, Olga. Oh, to have been around in the first half of the 20th century, the two world wars not withstanding! It almost looks 3D where his right leg comes to the forefront.